Globe 10.Ohhhh Look: A Bored Hockey Writer Talking About Baseball Pitcher Wins and Losses! Check out this Globe 10.0 video posted to Boston.com on Friday afternoon. It features former Bruins beat writer Kevin Dupont and Scott Thurston taking a look at some hard math and coming to something like a conclusion about the 2013 Red Sox. *Dupont jokes that they are a “reinvention of the Forever 500s” – a painfully dated reference to a defunct NHL franchise, the Hartford Whalers. 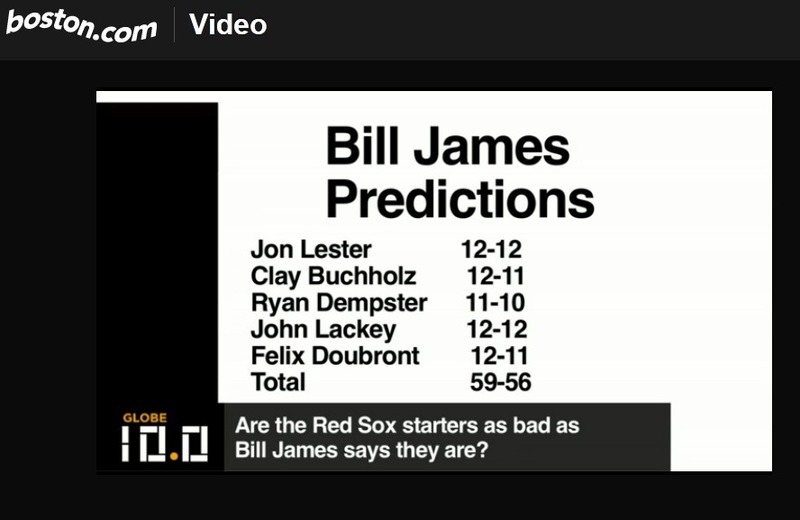 Let’s leave alone the fundamental disingenuity of portraying these projections as information Bill James, who Dupont flippantly classifies as a “high-priced statistician” at the end of the video, has provided the front office. The totals are a result of a system developed by James decades ago published in his annual Handbook and made readily available to the general public on sites such as FanGraphs. Projection systems by their very nature are meaningless when it comes to counting stats. They are particularly meaningless when contemplating fickle statistics such as Wins and Losses. Those totals would make Boston’s starting staff perfectly suitable given the team’s downfall isn’t likely to be scoring runs. They would be significantly better than last year’s results and well above the 2012 league average. – It’s cold in Boston in the winter. Thanks for coming out, fellas.